Social Media Help Diabetes Patients (And Drugmakers) Connect : Shots - Health News The number of Americans with diabetes is set to skyrocket in the next 40 years. Social media has given patients an online support network and information repository for dealing with their disease. Big drug companies are hopping on the bandwagon as well. 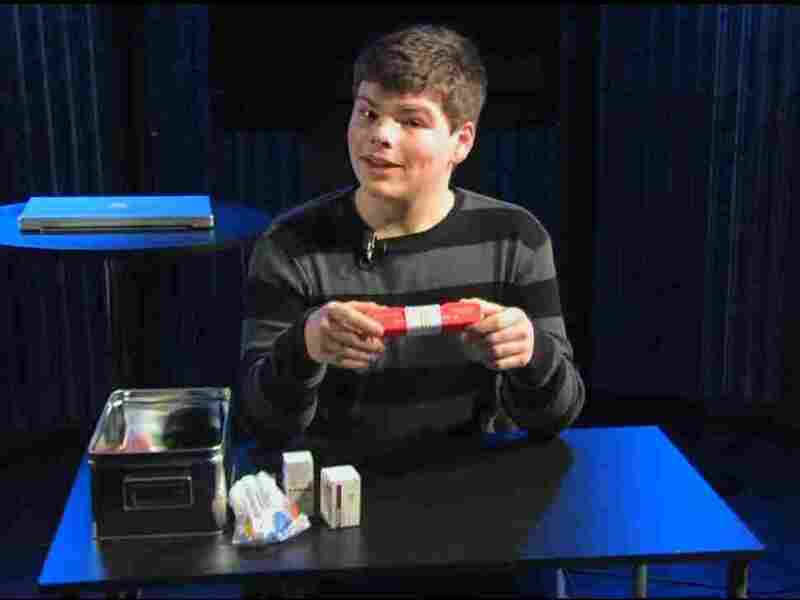 Cameron Harris, who has had Type 1 diabetes since he was 8 years old, explains the ins and outs of using glucagon for blood sugar lows. Harris hosts a video podcast series called "In Range" on YouTube. Sparling chronicles her own journey with the disease on a blog she started in 2005. Other people in the DOC — that's the diabetes online community — share on YouTube. There are videos with advice on everything from removing an insulin pump to telling your date you have diabetes. There are also reviews of products to treat diabetes. A few years ago, drug companies started paying attention to these video testimonials and to bloggers talking about their products. The companies even created their own social media sites. "Our primary platform is our blog Discuss Diabetes," explains Dennis Urbaniak, the head of diabetes at drug giant Sanofi US. They also have a Twitter account, a Facebook page, and a diabetes dictionary, and they're looking into Pinterest and Instagram. "Getting involved in social media is a critical component of serving the diabetes community," says Urbaniak. And it's not just serving the community; it's serving companies' bottom lines. Treating diabetes is extremely profitable. Every year Americans spend more than $100 billion on diabetes care. So, in addition to tweeting about new products, pharmaceuticals are sponsoring bloggers like Sparling. "If we're talking about what we want from our devices, it is in their best interest to be hearing that and making the changes we're requesting so they can improve their sales," Sparling says. Sparling has a disclosure on her website stating she receives free products from two drug companies, and that one pays her to speak at events and contribute at her site. But critics say that's not enough. "People do not read disclosures. The FDA and [Federal Trade Commission] need to create a whole new system for disclosing when a blogger or group gets paid by pharmaceutical companies," says Jeff Chester of the Center for Digital Democracy. He says pharmaceutical companies are using social media to promote their gadgets and drugs in a deceptive way. "Because you might find on a pharmaceutical website a series of videos that have been tested, by the way, to make sure that they really deliver the message, and these messages, testimonials, appear to be people like you. Although sometimes they are, in fact, paid or allied with a drug company," says Chester. Chester says pharmaceutical companies need to be very clear about their intentions and presence online. An FDA spokesperson says the agency is currently working on guidelines for drug companies and social media, but declined to make someone available for an interview. Urbaniak, of Sanofi, hopes new guidelines won't interfere with his company's online dialogue. He says tweets and Facebook comments help Sanofi connect with people in the diabetes community — and come up with ideas for ads. "In the past, the ads would always show the perfect blood sugar number, and the community says, 'You know, that's a bit insulting because it implies it is always easy to get this. Show a number that's high or show a number that's low. Make it real.' And so this is the kind of feedback that's been really helpful," he explains. But what are patients getting out of social media? It's unclear whether connecting online is helpful for adults treating diabetes. "There's no proof in diabetes that social networking is helpful," says Jason Bronner, a doctor at the University of California San Diego Medical Center. He's leading a study that will help determine whether social networking can actually help patients manage diabetes. "We know a lot of patients are on the Internet. Patients are more likely to get information from the Internet than they are from the doctor," says Bronner. That isn't necessarily a bad thing. Bronner refers patients to trusted websites and asks them what they're reading online. "As a doctor, basically what you want is to make sure the patient is relying on an accurate source of information, and if you don't know that they're on these websites, you're not going to know they have a chance of getting misinformation," says Bronner. Blogger Kerri Sparling isn't worried. She says the diabetes online community can tell when something's fishy. "If we see someone swooping in with their chocolate shake that cures Type 1 diabetes, there's going to be a voice raised saying, 'Wait, wait, wait, that's not true! Or, 'Don't come in and spam our community.' We protect ourselves in that way," she says. She says most people in the diabetes community want big pharma to pay attention to them. Now that they are, the challenge is making sure the relationship benefits people with diabetes, and not just the drug companies.